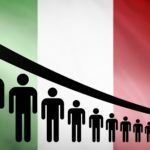 Though the official data shows that Italy’s population was growing until 2015 and according to a Eurostat projection it will stabilize within the next decades, the number of indigenous citizens is shrinking with an astonishing pace: every year by a quarter of a million, and this decline will accelerate. That means that the projected demographic growth can only be achieved by mass migration from Africa and Central Asia. Currently most migrants in Italy are from Romania but that number is declining rapidly. There will be less and less migration from other European countries because all European nations are in a dramatic demographic decline and because due to the prolonged Italian economic crisis the country is not a prime destination for people from other European states. If the official Eurostat forecast is correct, then within 60 years or, taking into consideration the current pace of migration even sooner, 50% of Italy’s inhabitants will be of African or Asian descent. The figures found by our demographic-research team are by far not unique and government statisticians have the same numbers. Not only are the Italian and European authorities fully aware of this, but they seem to be executing a re-population program on such a monumental scale that will dwarf the Swedish mass migration experiment. The Italian fertility rate (of indigenous and naturalized female citizens), i.e. the number of children per woman, is 1.34, which is far below the replacement level of 2.1. Much the same is true of the whole European continent. In this respect Europe resembles Japan. 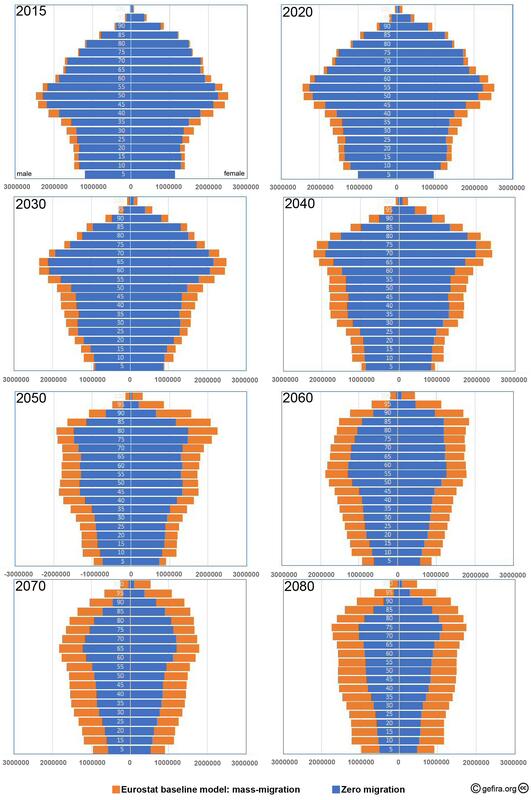 The difference is that while the Japanese authorities expect the country’s population to decline by a stunning 60% by the end of this century, the European governments predict a population growth. Why is that so? The answer is simple. The European leaders have opted for replenishing their nations with migrants whereas their Japanese counterparts have not. The Tokyo authorities refuse to replace their people with aliens, knowing full well that in the long run such a step would mean that Japan will only continue to exist in name. To get a better understanding of the demographic development in Europe, the Gefira team has developed software for population simulation, called Cerberus 2.0. The program is fed with millions of records provided by Eurostat and National Statistic Agencies of different European member-states. For Italy, Cerberus 2.0 began its simulation with the 1985 population level, which is the first year for which a complete database concerning death and fertility rates is available. To calculate the population of the subsequent years, Cerberus 2.0 increased the age of all groups. The program uses the age-specific fertility and death rates for each year. The number of newborns can be calculated from the age-specific fertility rate multiplied by the number of women in each year. The program can determine very precisely how many newborns there are and how many people die in each age-group. Demographic prediction without migration is the most precise forecast and leaves us with little uncertainty about the plight of the Italian nation. Starting with the year 1985, Cerberus 2.0 calculated that in 2016 Italy should have numbered 55 million people. Yet, according to Istat, the Italian National Institute of Statistics, there were 60 million inhabitants, which means that 5 million of them were immigrants. This fact was both admitted by Istat and predicted by our software. For the predictions after 2016 Cerberus 2.0 uses the fertility and death rates from 2016. This simulation gives a very accurate estimation of the future Italian population. Without a drastic change in the attitude to family life and reproduction in Western society, the fertility rates of native Europeans will not increase. A relative high number of children per family in some European countries are due to (especially) first generation immigrants. For example the overall (indigenous and immigrant) fertility rate in the Netherlands is 1.67 while the fertility rate of the women born in the Netherlands is a meager 1.5. Life expectancy will not change significantly the overall demographic picture. The death rate for the cohort of people aged up to 65 in Western countries is so low that improvements in this respect are hardly possible. Life expectancy of seniors can increase a little, but that will not affect the growth of a population in any significant way. Fertility generally ends at the age of 55. Demographers know precisely the future of the western native populations, and yet there is little or no academic debate about their looming extinction. There is a large group of social scientists who cling to the belief (and that’s the right word for it) that migrants from Morocco, Congo or Zimbabwe will absorb the Italian culture and blend into the Italian nation. The common reply to critics of immigration policies is that ”problems will disappear after the second generation” or that ”it will be like the US” where there are Italian-Americans, Chinese-Americans, African-Americans and so on. In other words, within one or two generations the new black Italians will behave as Italians, and no difference will be noticeable apart from their dark skin colour. A different opinion, based on tangible evidence, is deemed racist and treated accordingly. The discussion in “polite society” is focused on the size and speed of migration and the integration of the arrivals. Like it was in Galileo’s days, the believers have the upper hand over those who adduce observation and facts. The future US is not going to resemble the past US: the present US is already in the process of change. And yet, problems do not ”disappear after two generations”. France, which now has the third generation of third-world immigrants, faced ethnic riots over a decade ago, with the then President Sarkozy labelling the North African rioters ”scum”. Such conflicts can never be ironed out. Cultural clashes between Catholics and Protestant migrant communities in the US weren’t uncommon, yes, but they never evolved into the regular outbreaks of Islamic terrorism we are seeing in Europe today. Immigrants to the US were also never expected to benefit from a developed welfare system equivalent to the ones we have in Europe nowadays Mark Faber, a Swiss investor, was removed from many public functions for his remark that if Africans had founded America, the USA would look like Africa. While this seems a truism for ordinary people, the investor was forced to apologise by the politically correct community, high minded academics and journalists. Any person who believes mass migration from Africa will change the face and soul of the nation is labelled a racist. 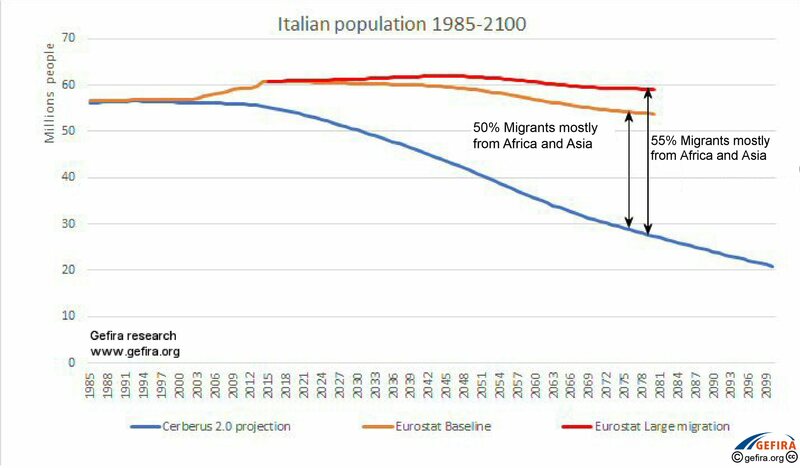 With zero immigration and the current birth rate Cerberus 2.0 predicts that in 2080 the Italian population will be reduced to about 27 million people and in 2100 it will be further reduced by 60% to 20 million, which is the same result as the Japanese statisticians predict for Japan. Surely, the renowned economists, policymakers, and trend forecasters are aware of such a drastic change in Western societies or are they? Despite these data, the Italian government and Eurostat expect that by 2080 there will be 53 to 60 million inhabitants in Italy. This can only be true if the indigenous population is replenished with 25 to 30 million first-generation migrants and their offspring from Africa or Asia. 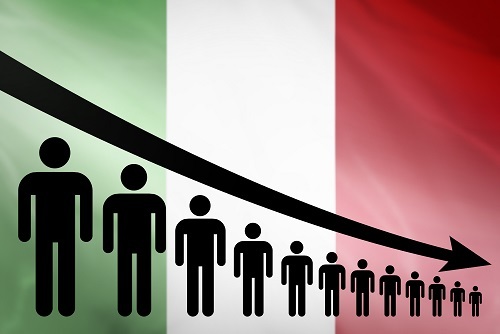 Even if migration does not accelerate, the Italians will be a minority by 2080. If we consider the migration rate of the last five years, this can happen even sooner. While the general public is unaware of its fate, top policy-makers know the numbers. German, Spanish, Norwegian, Irish and Dutch NGOs as well as the European Navy have ferried a shocking 600 thousand non-Western migrants from Libya to Italy since 2014. This has been done with the full complicity of the current Italian authorities. The grand replacement is no accident nor is it intended to be stopped. It is a well designed, devious program without the European natives having a say. Your first plot is drawn incorrectly. With higher migration the 50% migrant level is reached sooner, not later. yes the second should be 55% instead of 50 % thanks! White people do not have the right to preserve their cultures and identities. Your end is near. A black & mulatto Europe? Indeed, a comical tragedy in the making. Sarko said racaille. That doesn’t translate as scum, rather it’s rabble or riffraff.